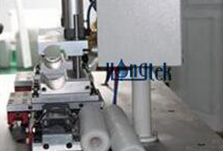 As one of leading supplier of water filter cartridges from China, Hongtek Filtration has strict production process and quality control system, especially for pleated high flow filter cartridges. We have 50 production lines and many material inventory, large production capacity of 100,000pcs cartridge filters each day. 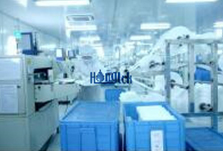 Select the good quality membrane media which tested by lab. Let the pleating machine as trial running to adjust speed and pleat depth with 3 to 5 layers. Then enter to steady operation and cut off the membrane when enough material area, then sent to the next procedure tidy and cleanly. 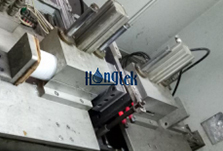 Ultrasonic thermal welding is a high technology for side seam sealing of membrane pleated, without any additives & glues, to ensure 100% integrity of side seam. 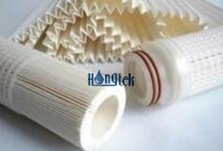 Keep wide chemical compatibility for the membrane pleated cartridge filters in filtration process. The length of pleated membrane is very important. The overlong on both sides of pleated membrane will be cut off to ensure the length fit to the cage and end caps of pleated cartridge. Make sure all membrane are welded and integrity, no side leakage. Assemble the befitting length of membrane pleated between the inner core and outer cage, the pleated cartridge have initial shape, keep semi-finished filters good quality, clean and tidy, then placed neatly to the next step. Thermal Welding the both end of pleated filter cartridge, fusing the membrane, inner core and outer cage together 100% integrity, no by pass. If need to connect sections to longer cartridge, thermal welded and make as a integer for the needed length of the pleated filter. 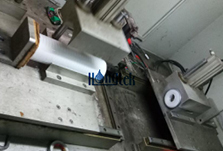 After both ends are welded, the main part of pleated cartridge is put in the middle of thermal welding machine, when each side carrying end cap.Then the two end caps automatic move forward to the middle and welded with the ends of the pleated filter cartridge, so that all the part of the pleated filter cartridge is thermal welded together, complete the production of membrane pleated cartridge filter.